I have a 87 Monte Carlo w/ console shifter.... the problem that exist is my key cylinder will go in the crank position start and drive but when i place the car in park the key cylinder won't go back to the off position to release the key. Ive changed the key cylinder and the problem still exist, i have noticed that if i play with the shifter taking it out of park and back in park this will allow the key cylinder to go in the off position releasing the key. Would this be a neutral safety switch issue or just a worn shifter cable or shifter cable bushing? This is a big inconvenience. Would appreciate the help. I'll assume your car has the backdrive linkage from the trans to the column. There is a bushing on the cross bar, on the frame side, down at the trans that wears out. It can be fixed on the cheap with an open end lug nut, or be replaced with an OE nylon. Now if that bushing is okay and there is no slop, the linkage can be adjusted. With the car in Park, just loosen the set screw, and push the linkage up to the stop; tighten the set screw. until you check out what fleming442 suggested you can grab the bottom part of the column and turn it left till it stops and you will be able to remove the key. You will see that part of the column move as you shift gears. Thanks fleming442 and pontiagp i will try this on my next of day from work. Thanks again! So after turning the column the key comes to the off position and can be removed, how do i fix that particular problem? have you checked out what fleming (with 1 m)442 suggested? Doing it right now....i see exactly what you're speaking of. Bushings are good but some play in linkage from firewall...loosen the bolt tightened things are working great now. First, glad you figured out how to take out the slop in your linkage. 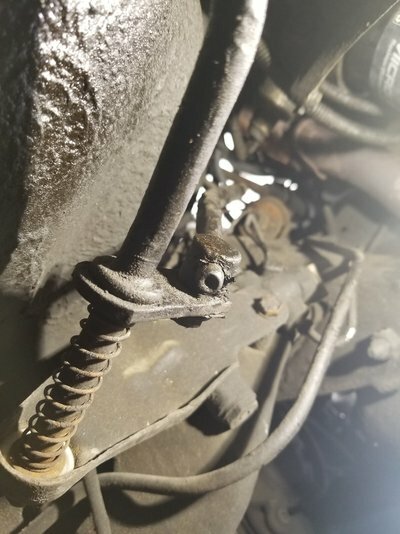 While the nut can be used as a temporary fix to get you by in case of a broken/missing bushing on the shift linkage, the nylon was used as the sacrificial lamb in the mix so as not to damage the bracket. Even using the greased lugnut, over time, you will wear out the bracket hole and end up replacing the bracket. Or you may not. You're just taking a chance.